resa design: Win $200 in prizes for you and your baby! Win $200 in prizes for you and your baby! To win- Leave a comment with your favorite (i.e. selection) Signature Tee AND your favorite Mom-Made product. You have to have both to win. Same rules as Birthday Bash day one. Leave your comment by 11:59 PM, CST, 10.10.08. It's super easy to enter. All you have to do is email us a birthday wish at CONTEST at RESADESIGN dot COM, by 7 PM, CST, today 10.10.08 Thanks to all who sent their kind wishes today- right back at you! UPDATE: This contest is now closed. Congratulations to Brooke, the winner of a Resa Design Perfect Fit blanket from yesterday. Be sure to contact us by the end of the day to claim your prize. We'll be back Monday with our Birthday Bash wrap up and prize winners! Thanks again for your amazing support. Our customers are the best in the universe! **Tech Update: If anyone was having trouble adding items to their cart this week, we solved the problem (it was with Internet Explorer). If you have any further problems, be sure to let us know. Thanks for your patience as we figure out our new software. oh, I'm so sad this week is ending. It's been fun to explore your sight. I'd love a spot, turtle, longsleeve 6-12 mo. for Andie. 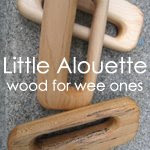 I've also had my eye on a rattle similar to the Little Alouette, so that'd be a huge blessing. Thanks for all the fun giveaways! I keep hearing news of more friends getting prego, so I'll be shopping here soon. Happy Birthday! I can't wait for the grand prize announcement on Monday and SOOO hopeful you'll choose me! I love tthe jewel neck Sweet Pea Tee in 2t. Thanks for the great week of giveaways. We'd love the Sweet P tshirt, jewel neck, in a 2T. I like the lap tee with a j in spot (size 18-24 months) and my favorite mom made product is gigi the giraffe wooden toy. I would love to win a longsleeve lap tee, size 12-18 months with a letter "m" in the olive pink! My fave mom-made product is the gigi giraffe by Little Alouette. There are so many fabulous items! Thanks for the fun birthday bash this week and for the great sales! I would love the Alphabet & Shape Tee in hot dot black dude crew short sleeve in size 2t with the letter j. Thank you! Mod Holiday Tee - tree. just love it! Gigi the Giraffe for fave mom-made product. fingers crossed. I agree. This has been a fun week. 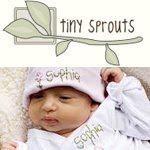 I also have enjoyed exploring the site and finding great baby gift ideas! I will definitely be back to order some fun stuff for people! The Signature tee is adorable. I would probably pick the alphabet and shape tee in the green apple or the clay- not sure which. I would like to pick something neutral in case we ever had a girl! Ha! That would be why we picked the letter "l" for our last name. Neutral is key! If I won I would get the 4T dude-crew cut long sleeved shirt. Again, that way it could be passed down for other kiddos! 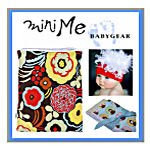 My favorite mom made product is from Jaymi http://www.etsy.com/shop.php?user_id=5216442 She has fabulous-homemade stuff and she is a mom of 3 kids. Thanks again for a fun week! oops - forgot to say mod tree, long sleeve, size 2T for my little boy! It has been a great birthday week...so sad it is almost over. It was fun exploring your site. Sweet pea signature tee is my fave. Cakies hair clips are my fave mom made item. 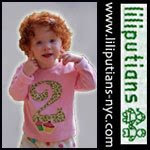 Our fav Signature tee would be the turtle in green apple sz 2T, love it! and love all the new fabrics. Mom-Made product - the Bel Kai Designs organic bag with the Mod Tree logo, you can never have enough of these. 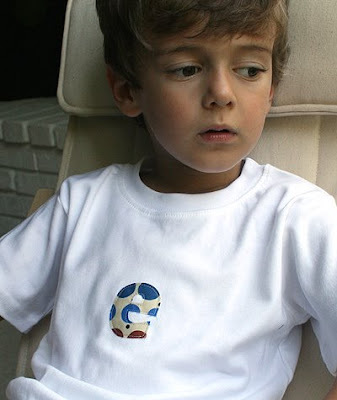 I would definitely want the Spot tee for my little man! And my favorite Mom-Made items are the Alphabet Hair Clip and the Julian and Co Necklace...I have a necklace by them that I adore! Happy, Happy Birthday! Happy Birthday! What a fun week this has been! My favorite mom made gifts are all the Little Alouette wooden toys-- I especially love Gigi the giraffe. As for a signature tee, I'd love a 2T Alphabet tee in lowercase j in Clay. I love the alphabet and shape tee, jewel neck, letter A in hot dot blue in a size 2T. My absolute favorite mom made product is the Julian & Co. galleria necklace. Thanks for the fantastic giveaway! I can't wait till Monday. I love the alphabet jewel neck tee with the letter K in hot dot blue in size 2T. 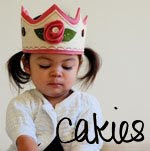 My favarite Mom Made product is Cakies alphabet clips. So cute! Thanks! My favorite signature tee is the temple pattern with the letter 'b' in an 18-24M long sleeve lap tee. My fave mom-made product is the Bel Kai Designs 'books' bag. The Sweet Pea Tee really is so adorable. I'd choose that in a 2T for my Sweetie. Another favorite Mom-made item are the hair clips and Kenzie Klips. One last time - Happy Birthday! I'd love a "Spot" (to match the surgery cap on last night's Grey's Anatomy!!!) Lap Tee, Long Sleeve, 3-6 months! Thanks for a fun week! I love the Mod tree holiday tee and in the mom-made category I like the JULIAN & CO: Galleria Necklace. I love the signature tee in green apple. Very cute. The Handle Maple Waldorf Teether is amazing. I'd love to give that to a baby to chew on. This has been fun entering your contests each day! I'd love a letter tee in spot with an "S" for my new nephew coming in a couple months! My favorite is the Pink Ribbon Tee. Like so many woman today I have personal connection to breast cancer. My grandmother passed of breast cancer in 1983. Happy Birthday! My favorite Signature Tee is the Mod Holiday Tee (Mod Tree) and my favorite Mom-Made product is the Bel Kai Designs Organic Bag (Mod Tree). I guess I really like trees, who knew?